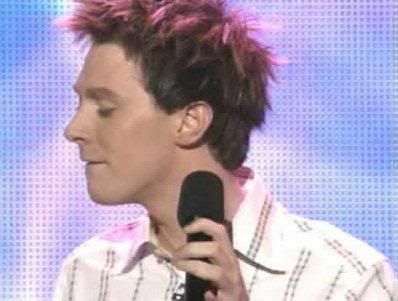 Clay Aiken – Singing To Win! The first night of American Idol’s Season 17 took place on March 3rd. It was a full audition program. I didn’t watch, did you? 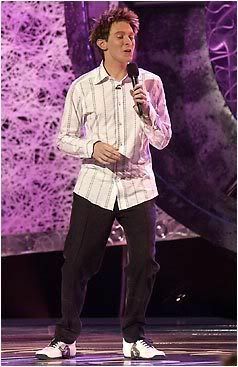 But more important, back in 2003, the first big stage episode of Season 2 was Motown. There were four judges on the March 11th show. Simon, Paula and Randy were joined by Lamont Dozier. Dozier is best known as a member of a songwriting and production team that was responsible for much of the Motown sound and numerous hit records by artists such as Martha & the Vandellas, The Supremes, and The Four Tops. He was a perfect pick for a Motown judge. On that night, the clip that introduced Clay Aiken to the audience made it clear that Clay had another passion in his life which was teaching students with disabilities. In the clip, Clay confessed that his camp name was Gonzo and he let some students duct tape him to the wall. Clay sang “Can’t Help Myself and the moment he opened his mouth, the strength of his voice and his range was up front. He seemed to command the stage and even though he didn’t move a lot, the audience was having fun. Clay earned the first standing ovation of the show. Randy said he was brilliant and Paula was amazed and thanked Clay. The support of the audience must have been overwhelming as Clay kept saying thank you to the judges and audience. The following evening, Heatwave was the first group song. The group seemed to enjoy the performance and it was a good introduction to the entire cast. The results section of the show was a nervous time for the performers and the audience too. After too long of a wait, Vanessa was “booted” from the show. Take a look at the performance of “Can’t Help Myself” by Clay Aiken and then you can watch the Group performance of “Heatwave”. Do you remember the Motown Show? Error: Error validating access token: Session has expired on Tuesday, 21-Aug-18 16:13:01 PDT. The current time is Thursday, 18-Apr-19 23:06:52 PDT.